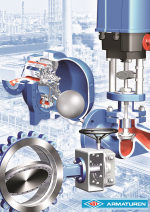 ARI-ARMATUREN reports it will be revealing an exciting array of advanced technology and product developments at the ACHEMA exhibition in Frankfurt this year, Hall 8.0, stand B45. The company says a new variable, compact control valve (STEVI Vario) will be making its debut at the show along with a fully lugged version of the ZETRIX premium process valve (available up to DN 600) and an array of products for medium pressure including bellows sealed, stop valves (gland seal), check valves and strainers from DN 65 – DN 100. ARI-Armaturen says with over 60 years of valve experience, launching CONLIFT (mechanical condensate pump) was a first and the CONA P now adds to the collection – a new pump trap with an innovative design combining a pump and steam trap- all to be revealed at ACHEMA. ARI-ARMATUREN has launched CONLIFT - the brand new mechanical condensate pump offering a versatile, economical and extremely effective way to collect and return condensate. PSL DATATRACK reports it has released a new 2014 version for its production management and business administration software reports which deals with all management and administration steps from initial quotation through to invoice. The company says this new version makes investment in the system even more attractive for manufacturers of sub-contract and make-to-order items, particularly for those in the high traceability industry sectors.